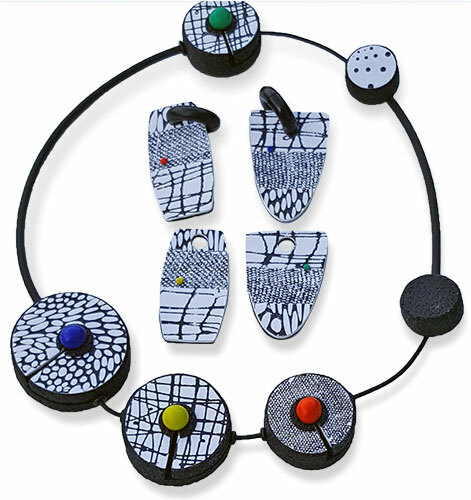 The Netherlands’ Lucie Blaauw has taken classes from an impressive list of polymer artists. This recent necklace and earrings set is from a Nikolina Otrzan tutorial. If you click through Lucie’s Instagram photos you’ll see her style change and her techniques improve as she continues to explore. Her works have become bolder and more dramatic and she injects what she creates with her own voice, no matter whose methods she’s trying. Best of all, she finishes a piece in each workshop so she can track her progress. Most of us have a drawer full of abandoned efforts. You’ll like her style and love her persistence.